The Trump National Doral luxury resort near Miami is Donald Trump's biggest revenue generator. As president, he will be able to steer environmental and labor policies that could boost the income from his golf courses. President-elect Donald Trump has financial stakes in hundreds of companies. But one line of business is particularly important to him: golf courses. He owns more than a dozen courses, which provide the Trump Organization with major streams of revenue and bolster his "luxury" brand image. But they also created conflicts of interest. As president, he will be able to steer environmental and labor policies that could boost the income from his golf courses. Take Trump National Doral. It's a huge luxury resort near Miami, and it provides a good example of how Trump's role as president and as businessman will come into conflict. The property is his biggest revenue generator, and appears to be a favorite of his. In October, just weeks before the election, Trump made a special campaign appearance at Doral. With a group of employees serving as his backdrop, he said: "We're very proud of this. It's 800 acres in the middle of Miami. It's been a tremendous success." Trump encouraged employees to step up and "say a few words." Several talked about how much they love working for Trump. But at Doral, and for clubs and golf courses around the country, new labor regulations promoted by the Obama administration are having an impact on how they do business. And many course owners aren't happy. Brad Steele explains why. He's the general counsel with the National Club Association, a trade group that represents country clubs and golf courses. Steele says the recession was tough on golf courses, and the recovery hasn't been easy. "The last eight years have been relatively difficult for ... the private club industry," he says. Among the labor rules Steele and his members are most concerned about is one that greatly expands the number of workers eligible for overtime pay. It has been criticized by business groups and Republicans in Congress and was recently put on hold by a federal judge. It's a rule that Steele thinks will be targeted by the new administration. "We are excited that now there'll be an administration that starts to look a little more ... critically at the impact that these kinds of things can have on business," he says. Amending the rule would have a direct impact on wages for employees at Trump's hotels, resorts and golf clubs. As such, it presents a potential conflict of interest. For Trump and his Doral resort, disputes over wages and overtime aren't just hypothetical. Rod Hannah is a lawyer who represented nearly 50 temporary workers who sued the Trump organization after not being paid for staffing a 10-day event at the resort in 2014. "It was a combination of overtime and not being paid even their minimum wages," Hannah says. "They were actually stiffed out of all of their wages." The workers had been hired to staff a Passover event at the resort. After they weren't paid, Hannah sued the Trump Organization. Hannah secured a settlement, but only after a lengthy legal battle. "Trump took a very hard-line, aggressive, defensive stance on the case up until the time we actually resolved it that they were not the employer of these individuals," Hannah says. In his arguments, Hannah cited a National Labor Relations Board ruling that makes it easier for employers to be held liable in disputes with workers hired by an outside contractor. It's a ruling Trump's designated labor secretary, Andrew Puzder, has said he wants changed. But it's not just labor laws that can affect golf-course profits. There are four golf courses at Trump National Doral and under a new federal rule, environmental regulations may increase. A new federal rule called "The Waters of the U.S." seeks to safeguard water quality by giving the Environmental Protection Agency and the Army Corps of Engineers authority over thousands of new waterways and wetlands. That's angered farmers, other landowners — and golf course owners. "For golf courses across the United States, this particular rule now mandated that anytime a club were to place fertilizers or chemicals on property, it might actually have to have a federal permit," says the National Club Association's Steele. Trump has promised to repeal the rule. It's an action that would directly affect Doral and his other U.S. golf courses. "By definition, it's a conflict of interest," says Trevor Potter, a former chairman of the Federal Election Commission and current president of the Campaign Legal Center, a government ethics watchdog group. He says that unless Trump sells his golf courses and hotels and sets up a blind trust, those conflicts will remain. "The point that the Trump people have been making is, 'We're allowed to have a conflict of interest because we're the president and the conflict of interest statute doesn't apply to us,' " Potter says. "That doesn't mean there's not a conflict. There is." Short of selling his holdings and creating a blind trust, Potter says Trump might turn over his businesses to an independent party not related to him — setting up a sort of "firewall" between Trump golf courses and the White House. On January 20, President-elect Trump stands outside the Capitol and takes an oath to faithfully execute his office and defend the Constitution. Afterward, his public acts may directly benefit his private business interests around the world, including his golf courses. NPR's Greg Allen reports from South Florida. 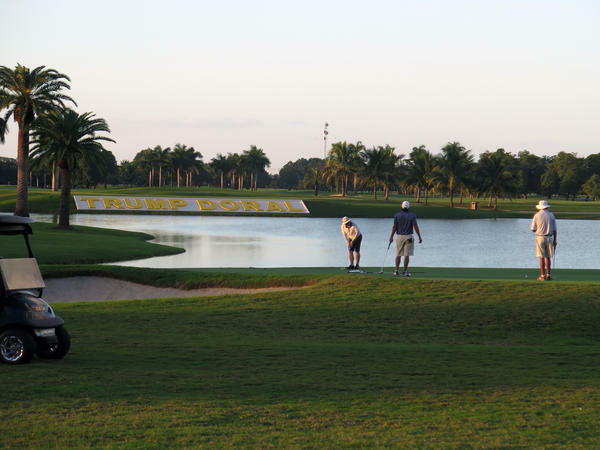 GREG ALLEN, BYLINE: Donald Trump owns more than a dozen golf courses from Scotland to California, but none make more money than Trump National Doral. DONALD TRUMP: So we're very proud of this. It's 800 acres in the middle of Miami. It's been a tremendous success. ALLEN: That's Trump in October, just weeks before the election. He made a campaign appearance at Doral with some of his workers. TRUMP: We have over a thousand employees, well over a thousand employees at Doral, 80 percent of them are Hispanic. ALLEN: For Doral and for all golf courses around the country, new labor regulations by the Obama administration are having an impact on how they do business, and many aren't happy. BRAD STEELE: To say the least, the last eight years have been relatively difficult. ALLEN: Brad Steele is with the National Club Association, a trade group that represents golf courses. The recession was hard on the industry and Steele says new labor rules have made recovery more difficult. A rule of particular concern is the one expanding eligibility for overtime pay. It's been criticized by business groups and Republicans in Congress and was recently put on hold by a federal judge. It's a rule that Steele thinks a Trump White House will change. STEELE: We certainly anticipate that the Trump administration will re-evaluate this particular rule. ALLEN: Amending it would have a direct impact on wages for many employees at Trump's hotels, resorts and golf clubs. And at Doral, disputes over wages and overtime aren't just hypothetical. Rod Hannah is a lawyer who represented nearly 50 temporary workers who sued the Trump Organization after not being paid for staffing a 10-day event in 2014. ROD HANNAH: It was the combination of overtime and not being paid even their minimum wages. They were actually stiffed out of all of their wages. ALLEN: The workers got a settlement, but Hannah says it took a lengthy legal battle. HANNAH: Trump took a very hard line, aggressive, defensive stance on the case up until the time we actually resolved it that they were not the employer of these individuals. ALLEN: Hannah said to help win the settlement, he cited a National Labor Relations Board ruling that makes it easier for employers to be held liable in disputes involving workers hired by an outside contractor. That's a ruling Trump's designated labor secretary, Andrew Puzder, has said he wants changed. But it's not just labor laws that can affect golf course profits. There are four golf courses at Trump National Doral and under a new federal rule, regulations may increase. The waters of the U.S. rule tries to protect water quality by giving the EPA and the Army Corps of Engineers authority over thousands of new waterways and wetlands. That's angered farmers and other landowners and, Brad Steele says, golf course owners. STEELE: Any time a club were to place fertilizes or chemicals on property that might actually have to have a federal permit. ALLEN: Trump has promised to repeal the Obama-backed rule. TREVOR POTTER: By definition it's a conflict of interest. ALLEN: Trevor Potter is a former Federal Elections Commission chairman and president of the Campaign Legal Center, a government ethics watchdog group. Unless Trump sets up a blind trust, Potter says, those conflicts will remain. POTTER: The point that the Trump people have been making is we're the president and the conflict of interest statute doesn't apply to us. That doesn't mean there's not a conflict - there is. ALLEN: Potter says if Trump doesn't want to sell off his businesses, he might turn them over to an independent party. But in tweets, Trump has only said that he plans to turn over his business operations to his oldest sons. Greg Allen, NPR News, Miami. Transcript provided by NPR, Copyright NPR.